Fourth of July is not just about freedom and independence, it is the mother of all things American. It has seeped through pop culture—inspiring music, literature, films and even food—making July 4 more than just a date, an anniversary, a celebration; it has become a way of life that most Americans live by. We may be an ocean apart from the US of A, but who says we cannot live the American dream within our own Pinoy fences? Let us not forget that for us, July 4 is also Filipino-American Friendship Day. Why not commemorate it in true-blue American fashion and celebrate it at one of America’s gift to mankind: T.G.I. Friday’s. First established in New York in 1971, and was first brought in the Philippines in 1994 by the acclaimed Bistro Group of restaurants, T.G.I. Friday’s has become an authority in quality American casual dining. And because Fourth of July is all about celebrating, we will give you another reason to boost your celebratory mood. Everyone’s favorite Chicken Fingers, with its good old juicy glory, will be available at 50% off as a Fourth of July treat. 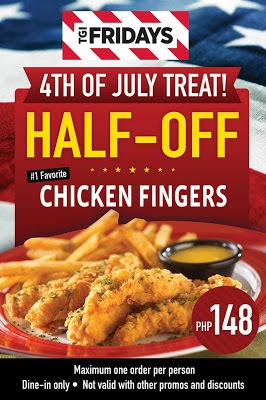 Now who needs fireworks, when you can have a party in your mouth at only PhP148?